Troop 320 at Mountain Brook Presbyterian Church, led by Scoutmaster Frank Tynes, held a Court of Honor Ceremony on March 4th for their newest Eagle Scout, William Gerry Krueger, Jr. Under the guidance of Eagle Scout Coordinator Tom Gester, William (Will) earned the rank of Eagle Scout from the Vulcan District Eagle Board on December 14, 2017. 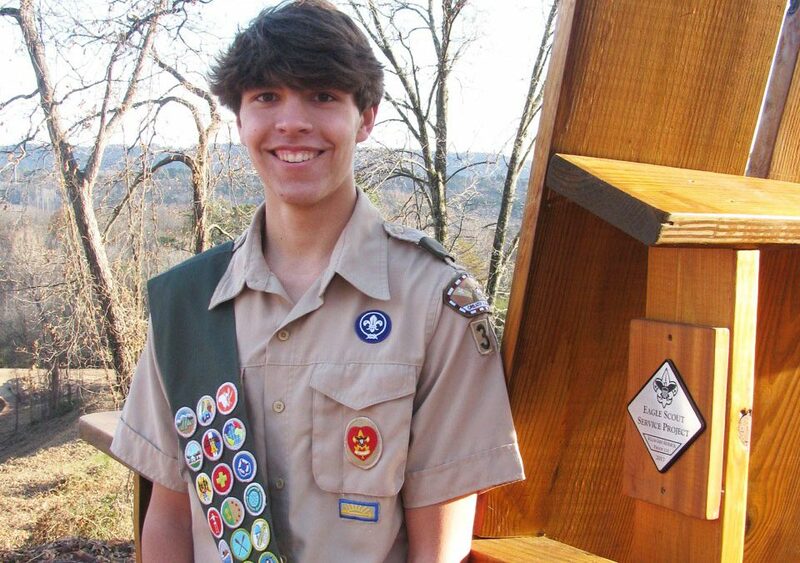 Will began his scouting career with Troop 320 as a Cub Scout in 2nd grade, and crossed over to Boy Scouts in 5th grade. He has been active in Troop leadership as a Den Chief, Patrol Leader and Assistant Senior Patrol Leader and remains active, often volunteering to teach skills to younger scouts for rank advancement and help plan campouts and high adventure trips. Will has earned 22 merit badges, and was elected to Order of the Arrow where he also earned his Brotherhood. With Troop 320, he attended the high adventure camps of Northern Tier in Minnesota and Philmont Scout Ranch in New Mexico, and has completed over 65 camping nights, 184 miles of hiking and 75 miles of paddling. For Will’s Eagle Service Project, he chose Red Mountain Park as his beneficiary because of the park’s unique mission of sharing the history of coal and iron mining in Birmingham, its central location that can be easily accessed by the entire Birmingham community, and because it is free for all to enjoy since there is no admission to enter the park. His family has been taking their dogs to the dog park and enjoying the hiking trails there since it opened in 2012. Will hopes service projects like his will continue to support the park’s growth and development. With the help of scouts from Troop 320, friends, and family Will raised funds, prepared the site, and built two giant Adirondack chairs with an oversized table made from a recycled steel spool. The chairs and table are located at the top of a ridge overlooking Mine #10, where they provide a welcome resting spot and great view for visitors. In honor of his service, Red Mountain Park held a dedication and ribbon cutting ceremony on December 16th where a plaque was installed to commemorate his service. Family, friends, and Red Mountain Park representatives including Al Folcher, the park’s Interim Executive Director, attended the event. Will is a sophomore at Mountain Brook High School and attends The Cathedral of the Advent. He is a member of Future Business Leaders of America and the 2019 Leadership Mountain Brook class. He plays defense for the Mountain Brook High School Varsity lacrosse team, is a Trilogy Academic Aces All-Star, and will play on the Trilogy ICE 2020 team in Baltimore, MD this Summer. He enjoys camping, climbing, bouldering, canoeing, sailing, slalom skiing and wakeboarding, and credits Scouting for fostering his love of high adventure and providing him with skills and confidence in these activities. Once he graduates in 2020, Will plans to attend college to study Business Finance. Will is the grandson of Jack Howard Krueger of Mountain Brook, and Marilyn Wike Williams of Hoover. He is the son of William and Janet Krueger of Mountain Brook.